We departed DC this morning and are downbound in the Potomac River, against a knot of incoming tide, just approaching Quantico as I start typing. In all, we were in the District just over a month, spending all of October and a day on either end. Other than a single night, we spent that entire time at anchor and put 96 hours on the generator. Vector at sunset in the Washington Channel. Seen from the roof of our friends' apartment building. It was yet a few days after my last post before Louise was able to narrow down a return date. In the meantime, I continued to enjoy the charms of the District, albeit with a bit of a chilly tender ride back and forth from the boat. 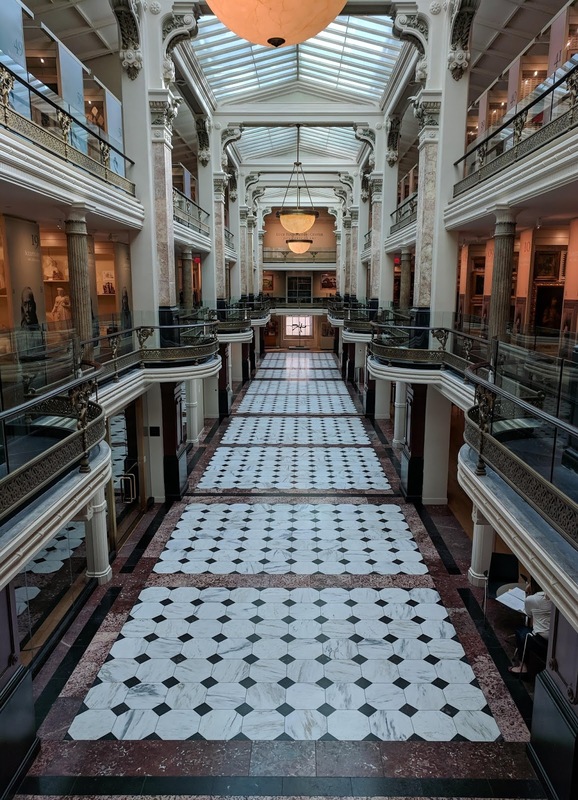 Having already covered most of the museums along the Mall, I decided to head toward Chinatown and visit the National Portrait Gallery, colocated with the Smithsonian American Art Museum. As I mentioned in my last post, often the buildings interest me as much as the contents, and this was no exception. 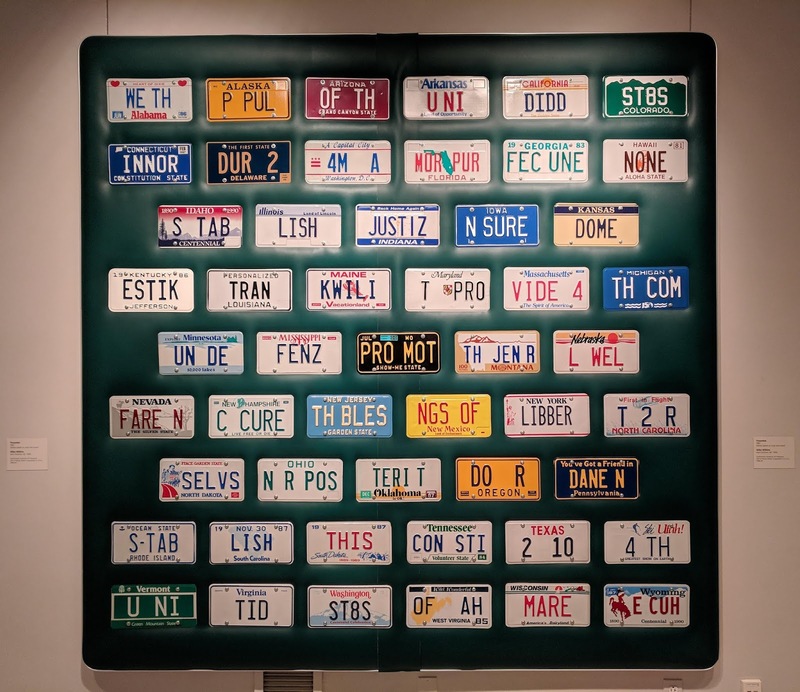 "Preamble" at the Smithsonian American Art Museum. I started out with lunch from one of the food trucks now ubiquitous throughout DC, dining right on the gallery steps. That was a much better deal than the lovely courtyard cafe in the museum, in a corner of the vast atrium, once an outdoor courtyard but now a dramatic inside space, complete with walk-through fountains. 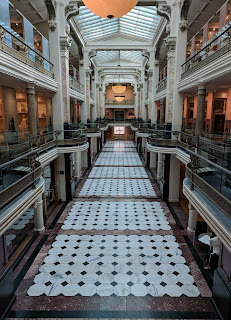 I did enjoy both the Portrait Gallery and the American Art Museum, but I more enjoyed strolling the vast spaces. The building once was the United States Patent Office, and is quite rich in history, being one of the earliest federal buildings in the District. Clara Barton once worked here, and Lincoln had his second inaugural ball here. Multi-story stacks which once housed scale models of every patent now hold collections of curated art and the museum's conservation department. One of the upper galleries at The Old Patent Office. I ended my day at the Law Enforcement Memorial and the brand new Law Enforcement Museum. The museum had literally just opened a few days earlier. Since I showed up at 5pm with a 6pm closing time, they let me in for a donation rather than the customary $23 charge, and at ten bucks it was just right. They still have a bit of work to do, and I was disappointed at the lack of any motor unit display. At least one day and several mornings were lost to allergies. When the wind shifted around to the north it brought some sort of allergen with it, as so often happens. On those mornings I tried to catch up on email, and I used one to sort through the lengthy ballot and cast my vote in the election. After dinner I again boarded the Circulator, getting off at the Safeway for a few groceries. That's when I discovered my credit card missing, and, reasoning I had left it at the restaurant, called them only to learn it had not yet turned up. I bought my groceries and continued home; they called my at closing time to let me know they had it. The temperature dropped to 42 overnight, the coldest I had yet seen. Fortunately, by this time, Louise had her relief lined up in California and was ready to book her flight home; I made the bookings for her using reward points. Tuesday the 23rd, a full three weeks after she left, into Reagan, with an arrival after dinner. That let us start thinking about a departure before the end of the month, headed out of this cold for warmer climes. I've been needing a massage for quite some time, and there is really nothing in the Wharf area. A few downtown hotels, including the Omni just a few blocks from the Wharf, have high-end spas happy to sell massages in the $150-$200 range, but a "spa experience" was not what I wanted to pay for. I ended up booking a place out in Adams Morgan, near the zoo, which turned out to be mediocre. But while out there I wandered into the Marriott Wardman Park just to use the rest room, and happened to stumble into the Anime USA conference. That, at least, explained some of the outfits I had seen riding the Metro. Of course, I had to end my day right back at Barracks Row to retrieve my credit card, and so I ended up sampling a couple of the other joints along the street. I'm a little sorry I had not discovered this neighborhood earlier. On one of the more pleasant days I struck out just to walk around town, and ended up on the spur of the moment walking into the Newseum. 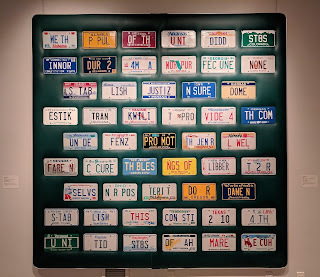 At about the same price, this one was much better than the Law Enforcement museum, and I can highly recommend it. I should have gone in a bit earlier, as I ended up closing the place down. 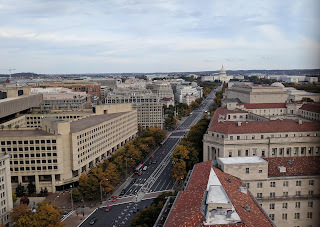 This is another place where the architecture was also of interest to me, and as a bonus, the rooftop terrace affords magnificent views from the Capitol all the way around to Federal Triangle. 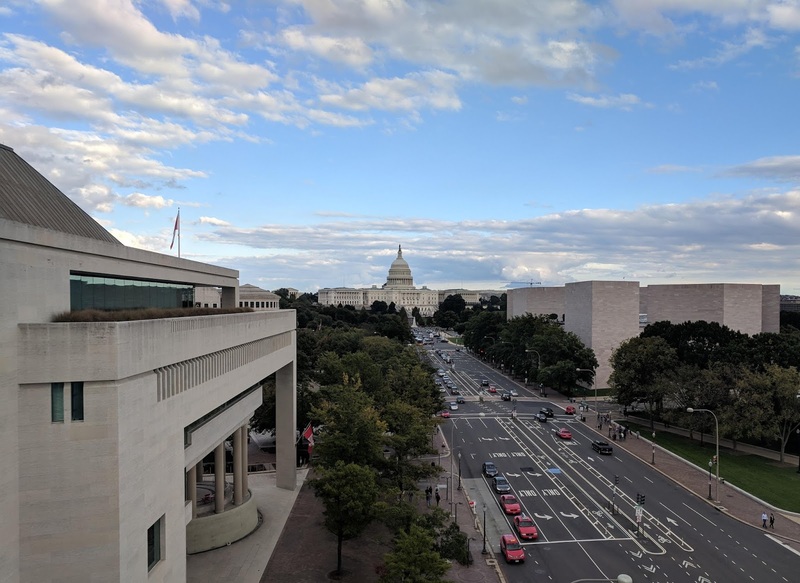 The Capitol as seen from the terrace at the Newseum. I made another pilgrimage to Georgetown, this time to drop off a return at the Amazon store. Amazon wanted $5 in shipping otherwise, and it only cost me $2 to go out there on the Circulator so I viewed it as a free trip. As long as I was out there I had a beer atop the Graham Hotel, with a lovely view over Georgetown and the river, and I got a kick out of meeting a brace of young attorneys visiting from Fort Lauderdale. One of the consequences of Louise's extended absence is that I ran out of clean clothes. We do have full laundry facilities aboard, but they use so much water that we either need to be at a dock, or within a few days of one in order to use them. 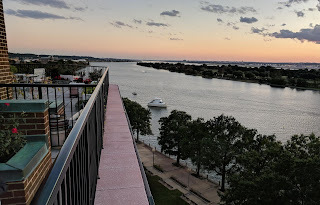 I spent an evening using the facilities at the yacht club, and having dinner at the Wharf while my dryer ran. I'm not sure why it did not occur to me much earlier in the month, but I realized just before Louise returned that the Mexican Embassy was an easy walk, and just before she got back I headed over there to see if I could turn in the Temporary Importation Permit for the our former bus, Odyssey. Sadly, that turned out to be a service they can only perform at consulates closer to the border (including, of all places, Chicago). They were at least able to give me information about possibly handling it by mail with Mexico City. From the Mexican Embassy it was an easy stroll to the Smithsonian's Renwick Gallery, where I took in the current exhibit, The Art of Burning Man. Being deeply connected to Burner culture and also to that part of the desert, the most interesting thing for me was to observe the reactions of the mostly local or northeastern visitors. From there I made my way to Meridian Hill Park to see the cascading fountains, but they were closed and drained for the season. For that matter, almost every public fountain in DC has been empty since we arrived in September, and only a handful of private ones, such as those at the Wharf, have been operating. As we wrapped up our visit, several were in the process of conversion to ice skating for the winter. My final day of bachelorhood was spent cleaning up the boat for Louise's return. That included stowing Mr. Roboto, the freestanding air conditioner in the stateroom, which unfortunately had accumulated some mold along with tons of dust in the filters. It also including stowing the inflatable kayak for the season, and loading and stowing the bicycle which I had been using ashore. New friends Jay and Pam from the yacht club had invited me to play Bocce on the public court right across from Vector at 5, and after a few quick rounds they invited me up for a beer and a quick tour of their waterfront apartment. I enjoyed the sweeping views from the roof terrace as well. Sadly, I had to rush out in order to grab prescription cat food on my way to the airport. The excursion to Petsmart meant I had to walk a half mile to the airport terminal from the bus stop in Crystal City. Airports are decidedly not designed to be entered on foot, and I followed a convoluted and circuitous route through various backstage parking areas before reaching the terminal. I had a few minutes to wolf down a salad before Louise made her way off the plane. Our elation at her return was short-lived. By the end of the next day she was coming down with a full-blown cold and would soon be down for the count. We managed to drag ourselves to the bank mid-day for a scheduled appointment to have our signatures guaranteed, and that wiped her out. We did just manage to also get ashore for dinner, but were only up for the closest place right on the Wharf, Kirwans. By Thursday she could not even do that, and we waved off the nice dinner reservations I had made at the City Club, and I ended up fetching a pizza from the dockside stand at the Wharf. In all, we lost three days or so to her cold. On the plus side, in that time the downward trend in temperature mitigated and we could see perhaps three nice days in DC on the horizon, and so we opted to extend our stay a bit. Fortunately I discovered there is a pumpout boat that services the anchorage (for free!) and after nearly four weeks we needed it. The other hangup was laundry. And mold. In the depths of the cold I pulled my parka out of the coat closet to discover that most of our coats and especially the leather ones had a white growth on them, something in the mold or mildew family. Getting to a dock to address these two issues became paramount, and that was beckoning us to leave DC. We opted instead to just spend a night at the dock at the yacht club, who fortuitously had space available. We weighed anchor Monday morning, bringing up tons of fishing gear and parts of Jimmy Hoffa's clothing. After fiddling around with snips clearing the ground tackle for 20 minutes, we finally cleared the anchorage and made it to the dock, where we immediately started taking on water and running laundry. It was one of the colder days and nights, so it was nice to have the power available as well. 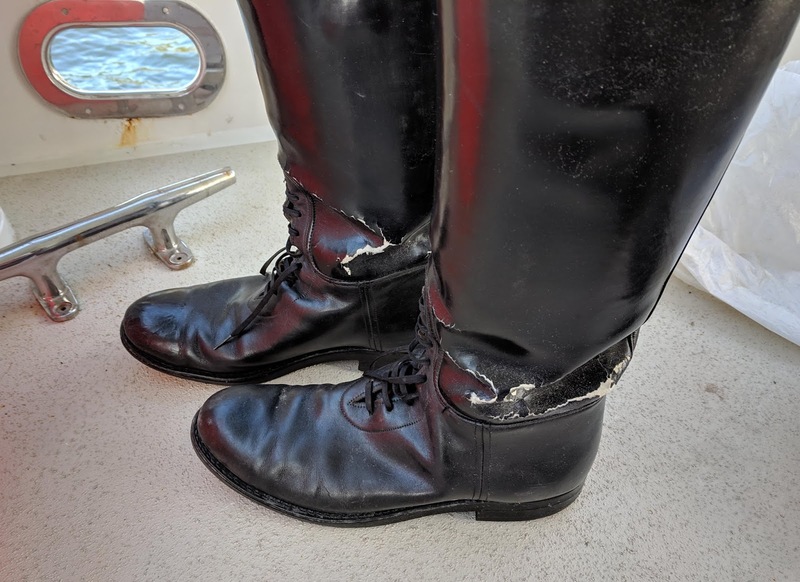 Not a victim of mold, but rather just age, I tossed my cherished bal-laced Dehner motor patrol boots in the post-mold purge. Louise did all the accumulated laundry on the boat, and I set to work wiping down all our leather coats and boots with a vinegar solution. Machine washable coats and linings made a trip through the washer. And we sprayed down the insides of the lockers with Concrobium, in the hopes that will keep it at bay. Other than an excursion for dinner we basically spent our entire dock day on the boat doing chores. We filled the water tank before dropping lines. That at least let us breathe easier about spending another few nights in town, and we returned to the anchorage. Another boat snagged our spot so we ended up a few hundred feet south (map). We did not tell them about finding Jimmy Hoffa on the bottom there. I squeezed in one last museum stop, at the Smithsonian's Postal Museum in the historic old post office next to Union Station. This on my way to a final Walmart run, followed by picking up a gallon of gas for the tender at the closest gas station. We did finally make it to the City Club for dinner, a belated birthday celebration for Louise. It's gone downhill since our last visit three years ago, which seems to be a trend among clubs now. We spent some time at, of all places, the mall at Pentagon City, to get some needed shopping done. 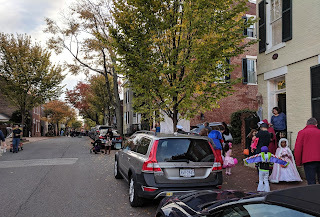 And we spent the evening of Halloween in old town Alexandria, where we found one of the historic residential streets closed down so the children could trick-or-treat; it was very endearing. Trick or treating in Alexandria. Even the residents wore costumes. I got a kick out of the little Buzz Lightyear. For our very last evening in town, one of the warmest since Louise returned, we ventured to the top of the historic Post Office Tower, the third tallest building in DC (only the Washington Monument and the National Cathedral are taller) to take in the view, one of the Park Services hidden free gems in DC. The tower holds the Bells of Congress, and as it happens, the Washington Ringing Society practices ringing the bells every Thursday. We got to hear them on our way home later. 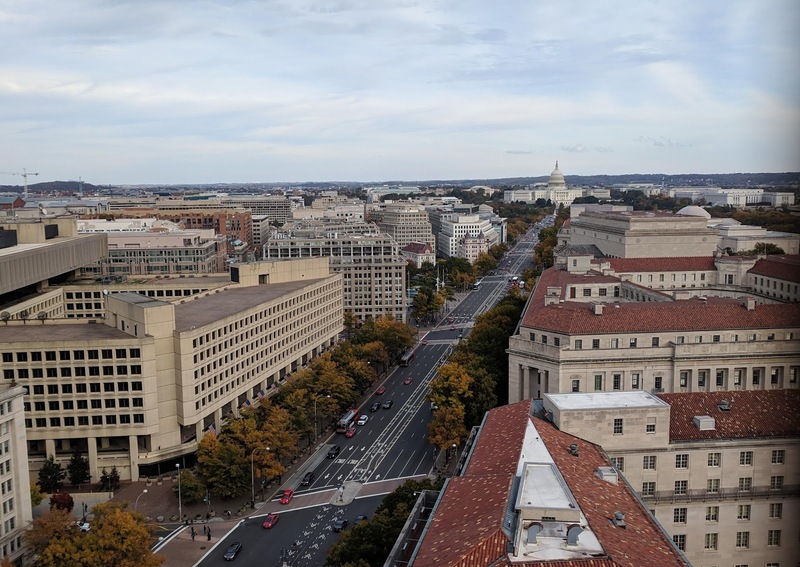 The view towards The Capitol from the Post Office Tower. FBI building at left. Having started the evening with a birds-eye view, we continued the theme for cocktail hour by heading up to the P.O.V. lounge atop The W Hotel. This ultra-trendy joint will clean out your wallet if you have too many drinks, but the view is fantastic. While we were sitting on our bar stools overlooking the Treasury Building, we noticed that the Secret Service had closed off The Ellipse with a marked cruiser. A few minutes later the unmistakable sound of a Sea King helicopter explained why. The view of the White House from this location is not great, unless watching armed guards patrol the roof is your thing. Nor can you directly see the South Lawn. But we had a clear view of the presidential white-top lifting off, turning, and heading south over Vector. It was either an empty return trip, or (less likely) a distinguished visitor, as the chopper was not immediately accompanied by two of its brethren in the usual flying shell game when the CinC is aboard. Still it was interesting to watch, and I made a short video. "Marine One" taking off from the south lawn. I might mention here, as I did three years ago, that anchored in the Washington Channel for any length of time, you will become intimate with an array of helicopters that buzz by just a few dozen yards overhead. The vast majority of these are unmistakable Hueys in VIP trim, but the Sea King and White Hawk presidential Marine choppers come in second, often flying over in threes. The occasional police or Coast Guard unit is an almost daily occurrence, and fully armed military Blackhawks round out the roster. The channel is the designated helicopter flyway; further west is Reagan controlled airspace, and further east is off limits to all aircraft. We had a final dinner at The Occidental Grill in the Willard Hotel, another place we'll skip in the future. We dropped our keys off at the Yacht Club, and decked the tender as soon as we got home. Just as well, as the wind and chop picked up soon after. The fact that they are assembling the outdoor skating rink at the Wharf is a sure sign it was time to move on. Our last hurrah in DC, as it were, was to hear the crowd cheering for DC United at Audi Field, which was quite loud even from nearly a half mile away. Not really Air Force One. 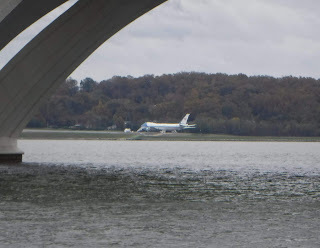 This morning's cruise brought us past National Harbor, where we spotted the latest tourist-fleecing attraction, a full-size replica of Air Force One. This had been brought upriver just a few days ahead of us on a barge (it's not airworthy), and they were still offloading when we passed in the other direction. It's basically a generic retired 747 that's been painted outside and mocked up, as best as they knew how, inside to look like the real Boeing VC-25 aircraft. Apparently the contractors that did the painting and interiors are still owed money and are threatening a lien. 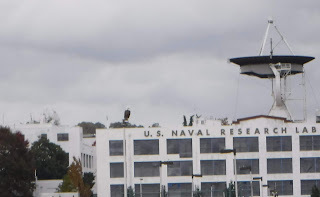 The highlight of the morning was spotting a bald eagle atop a post on the pier outside the US Naval Research Laboratory. The eagle was unfazed by one of the aforementioned Hueys buzzing overhead just as I snapped my photos. A bald eagle guards the pier of the Naval Research Laboratory. Update: We are anchored in the Potomac, just across the river from where we anchored on our upbound trip (map). We had a favorable current for the last part of the day and continued until nearly 6pm to take advantage. It was dead calm when we anchored and through dinner, but a couple of hours later a huge thunderstorm moved through and we had a tornado warning. Our anemometer registered winds of 43mph and we had perhaps three footers here. The wind managed to drive some water in around some of our portlights and we had a mad scramble to mop up. As I finish typing here around midnight the storms have passed, we had no tornado, and the river has once again calmed down. I expect we will make an early start tomorrow and end the day somewhere near the mouth of the river. Once we're on the Chesapeake we'll have higher water temperatures and slightly more temperate conditions.